President Barack Obama has finally revealed the big news that Americans have been waiting six long years to hear. In a meeting with The Wire creator David Simon, the President unveiled the answer to the question that has dogged him since his inauguration (and no earlier, because we didn’t care prior to that): Who is his favorite character on The Wire? 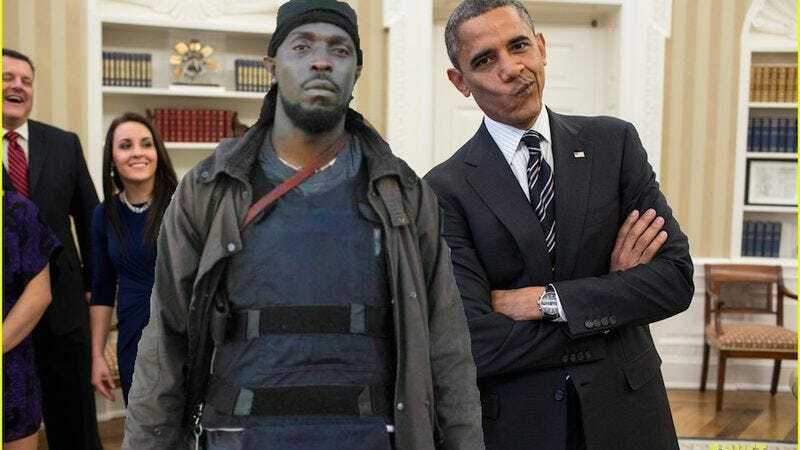 “Omar is, by the way, my favorite character on my favorite show,” Obama said, echoing the opinion of all right-thinking people everywhere. He wasn’t caught. He actually went in on conscience because it finally got to him. He came out 17 years later, and all he wanted to do was give back to West Baltimore. He had taken so much, and he just wanted to address himself from the disaster. And on paper—that man was an extraordinary man, one of the most extraordinary men I have met in my life—but on paper, he was a convicted felon and a convicted murderer. Hopefully this will be the beginning of a sequence of interviews Obama conducts with show creators in relation to how their TV series can speak to the need for policy change. We at The A.V. Club eagerly look forward to his discussion with House Of Cards creator Beau Willimon about how his series demonstrates the need for campaign finance reform, because based on that show and another fictional program called representative democracy, the two major parties are hopelessly corrupt.